The older I get and the more I master the medium, the more I return to my earliest experiences. I think that at the end of my life I will recover all the force of my childhood. It’s the young people who interest me, and not the old dodos. If I go on working, it’s for the year 2000, and for the people of tomorrow. There are two quotes here from the great Spanish painter Joan Miro (1893-1983) that really strike a chord with me. Both come from him when he was older and both speak very much to the way I feel about my own work. In the first he speaks about gaining more mastery over the medium through the years while simultaneously moving closer to the vibrant energy that one has in their youth. I have felt the same feelings. The more one gains control over their form of expression, the more they are freed from the constraints of conscious thoughts and decisions. The work becomes reactive to the feel and emotion of the moment. Now, I will add that with this acquired mastery there is also a new barrier erected to overcome. Well, at least, in my experience. I have found that with years of work, which is, in effect, rehearsal and practice, there is sometimes a loss of spontaneity and passion in the actual making of the marks. They become a little too precise, a little too mannered and a bit too clean and neat. They don’t have that feeling of wanting to burst off the surface. I have found ways to get past this–using bigger brushes and making strokes quicker with more urgency, for example– but every so often I will get near the end of a piece and it just feels too neat, too precise, for the underlying emotion. It needs the innate exuberance of a child at play. The second Miro quote, made when he was 82, speaks of painting not for those of his age but for the younger and the future generations. I certainly understand this sentiment. I am most thrilled when children react to my work, knowing then that it is speaking to the aforementioned innate exuberance. It means I am not dealing with intellect or acquired knowledge or conscious thought. It is a pure and uninformed reaction. It means the work is communicating emotionally across and out of time. And I think this is important because I believe most artists wants to break free from their own era, to not be consigned to any single period of time. To be known for what they were at their inner and eternal core, not where or how they were categorized in their time. 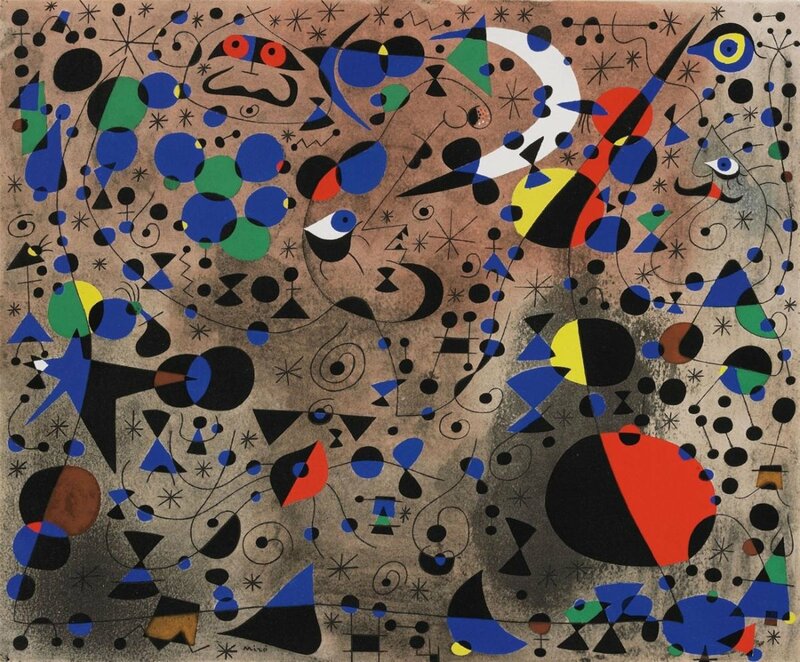 Maybe like the Miro painting at the top, a single small voice among the multitude of stars and constellations in the universe. I don’t know but that might be my primary goal in doing what I do. It’s a balancing act; keeping the child’s spirit alive in the art through the years the adult’s hands and eyes are mastering the craft. I would think that would mean always allowing your inner child to run loose through your paintings looking for things to wonder at and explore, and not worrying about the little guy making a mess. What a great state motto.